Cleaning your bong can be a difficult task. While it might not seem like letting the substances inside sit for a bit would cause much harm, they can. Because of this, it’s vital to clean it out often. If you’re looking for how to clean bongs, keep reading. This article will give you some helpful advice as to how you can do so. These products need to be sanitized for a few reasons. One is that bacteria can eventually grow into it if not removed. This can not only damage your bong but can be very harmful to your health. Another reason you need to clean it out is because it can ruin the flavors inside. Resin can form and stick to the glass of the bong which will end up giving the contents inside a very powerful resin taste, something you don’t want. Resin can also be quick at building up. If you don’t clean your bong out after a use or two the resin inside will just continue to form new layers which will end up making it very difficult in the end to clean. Too much resin can actually end up hurting your health and can lead to extreme coughing. 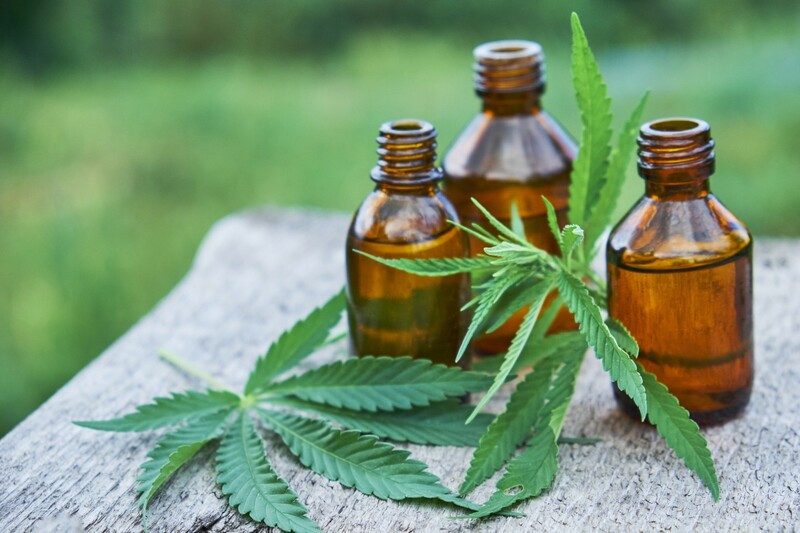 It also can remove the pleasant smell that cannabis has in the bong and instead mask it with its own odor. For these reasons, it’s vital that you clean out your bong as much as you can. These products come with a very intricate system, and one that should be understood before you take it apart to clean it. On the bottom is the base which helps to keep the bong supported. This base is attached to a bowl which is what hold the materials inside so you can inhale them. 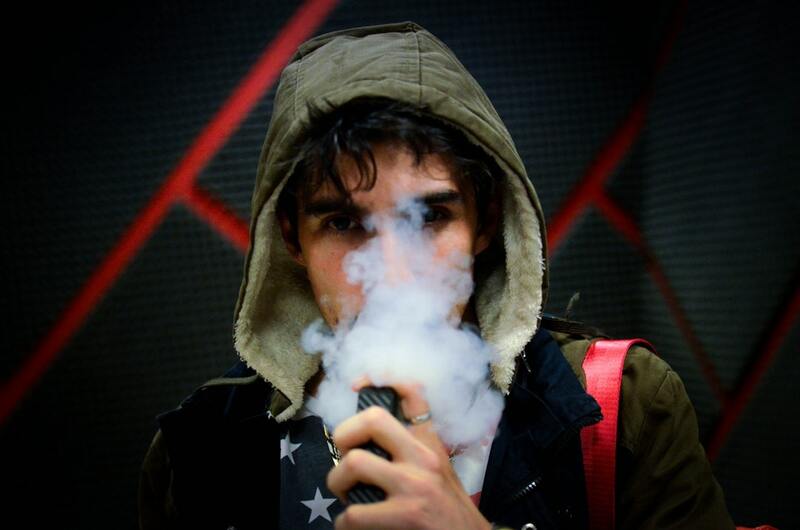 You breathe in the smoke from the contents inside the bowl through the tube. Around the side is a carburetor which is a hole that helps to clear the smoke that’s in the bong. The bowl is usually removable so you can easily clean it. However, the other parts can be a little difficult to clean, like the carburetor. Because of this, you’ll want to carefully work to clean it all out and remove any pieces that are removable. Bongs come in many different materials which can make cleaning them each correctly a little tricky. Glass bongs are one of the most popular types of bongs to use. They have a very sleek look, but they can show buildup easily. Cleaning this type isn’t the most difficult though which is good but it’s a very delicate material so you have to be cautious when cleaning it. Plastic is another popular choice because it’s affordable and quite durable. Plastic is easy to clean but can show signs of buildup easily so you’ll have to clean it out often. Unlike glass, it won’t scratch easily if you place adhesives, like salt, in it. Ceramic bongs are very heavy bongs but they also tend to be more colorful and creative with their designs. Ceramic bongs can be a little tricky to clean because of their make so you’ll have to spend some time doing so. You can sometimes put some baking soda into ceramic bongs to help clean them better. Bamboo is a unique bong material to use and just like ceramic, it can be a little difficult to clean. This is due to the wood absorbing quite a bit of the smoke and odors that the cannabis creates. This material is also very sensitive to water so it’s best to not clean it with hot water to prevent damaging it. Metal is another popular choice to use for bongs because it is simple and comes with a very nice shine. However, after a few uses the metal bong can sometimes give a not so fresh taste, even after you clean it. This type isn’t difficult to clean but even the most intense of cleanings for it might not fully remove all smoke and residue from it. You don’t need to invest in expensive products to help clean your bong. All you need are things like brushes, cotton balls, paper towels, and cotton swabs to help you. Brushes are a great way to help scrub out residue inside the bong. Bong brush cleaners come in various styles and widths so you can clean your bong out well. These are designed to be long and have thick bristles to help get into the nooks and crannies of the bong so it’s well cleaned. One brush you can try with your bong is the Sohappy Brush Set which features 2 brushes that are made out of a reusable foam you can wash off. This brush is flexible so it can get into all the pieces of the bong thanks to its 18 inch foam head and 5 inch handle. Another great product is the Texas Hookah Brush Set. This is an affordable product that comes with a cone-shaped brush that can reach all areas of the bong well. It works with bongs up to 24 inches tall. The Pro Products Nylon Brush Set is also a good choice to try. It has 2 sets of brushes that each come with 10 brushes of various sizes and widths. You’ll find brushes with 2 to 24 mm diameters so you can be sure all areas of the bong are cleaned. It also has a keyring on the end you can use you hang it up when you’re done using it. Cotton balls are very gentle and are ideal to use on sensitive bong surfaces like glass. They can wipe away residue without smearing it and are also very affordable which makes them ideal to use. You can place a cotton ball on any openings on the bong to help seal it so the liquid cleaner inside it doesn’t spill. The cotton will absorb any liquid and you can secure it to the bong with a rubber band. If you don’t want to use cotton balls to plug the bong’s openings up, you can instead use res caps. These work like plugs and you can reuse them over and over again. A good res cap product to try is the Res0lution Caps. These caps are a universal fit and come in many different colors. They work well at sealing the openings to prevent any leaks. Paper towels always are a great tool to have on hand when it comes to cleaning bongs. They can help to clean the interior out and dry off the bong after you rinse it off. However, don’t just use paper towels solely as a way to clean your bong as they won’t give it a deep clean. These are handy tools to use when you need to wipe out small pieces and spots on your bong. The tips can reach small areas and openings that many other materials can’t. You can even cut off the tip and use its stick as a scratching device to remove hard residue from the interior of the bong. Muji Cotton Buds are a great type to use to help with cleaning. They are made with a unique black design which can help you to see how much dirt and residue has been removed from the bong. 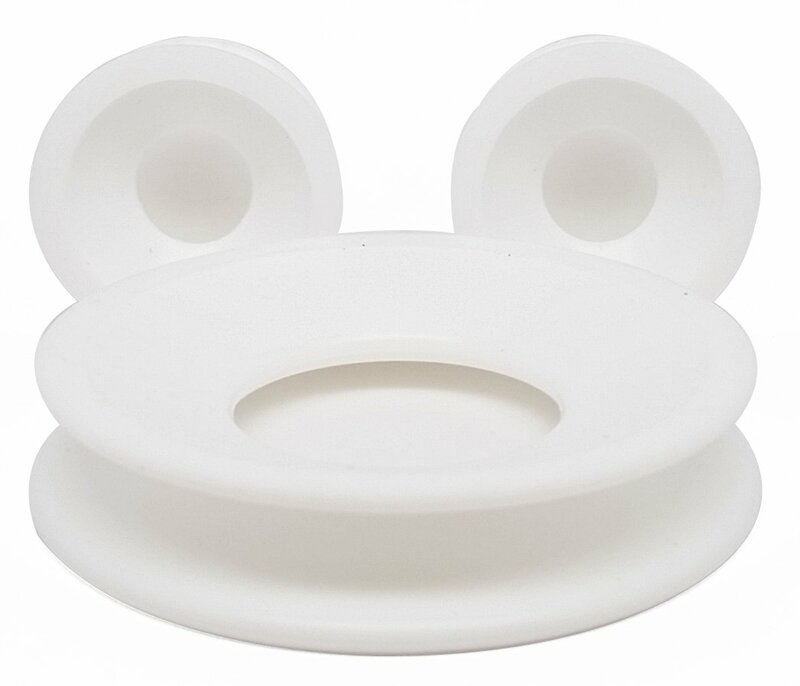 They are also anti-bacterial which can help with fully cleaning the interior of the bong well. Muji Cotton Buds come with 200 pieces you can use. An interesting way you can reach spots in your bong is by using magnetic cleaners. These come in two pieces, one which goes on the inside of the bong and is covered in a soft cleaning fabric, and the other on the outside of the bong. The two pieces will connect together thanks to their magnets and you can move them around to various areas on the bongs to clean it. One magnetic cleaner you can use is the Cuisipro Spot Scrubber. This magnetic cleaner is made with a sleek black design and can fit inside almost any bong so it can clean it. It’s simple to use and has a special handle on the exterior piece so your grip can stay steady when you glide it around to various areas on the bong. The interior piece has a special cloth on it that is rough to help remove tough stains, but soft enough so it doesn’t scratch the bong’s surface. If you don’t want to spend a lot of time cleaning out your bong, you can use liquid bong cleaners. These work quickly and can remove quite a bit of the residue inside the bong. Below are some great liquid cleaners you can use. 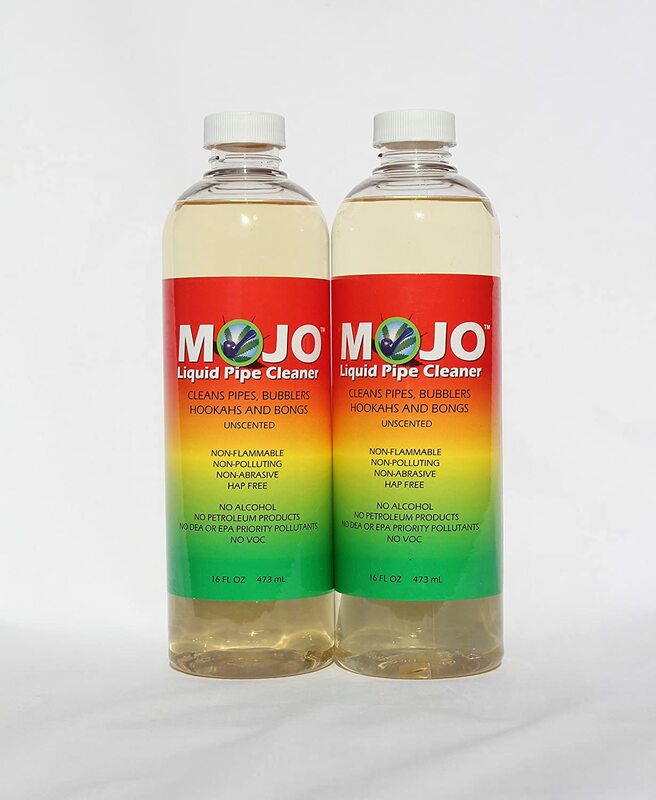 The Mojo Pipe Cleaner comes in 2-16 oz. 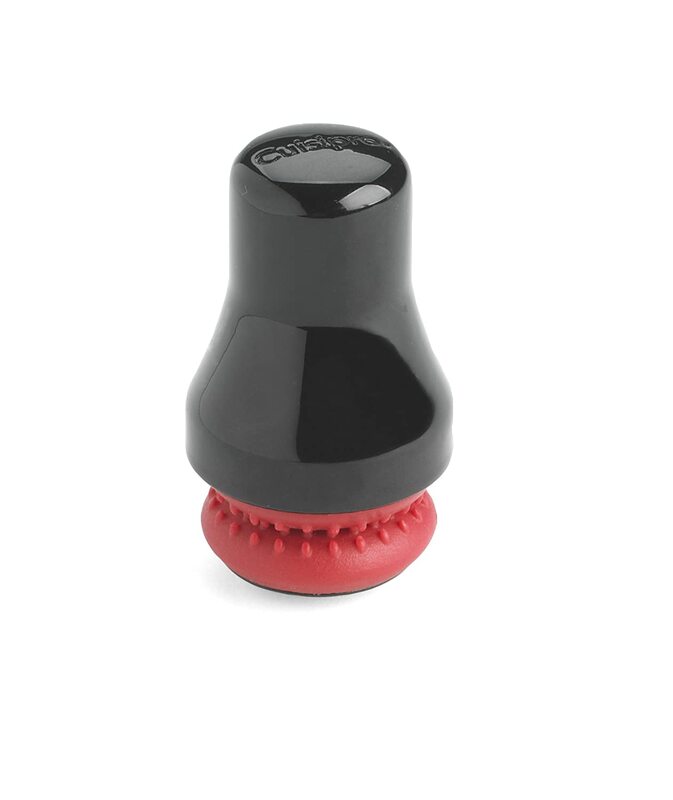 bottles and is designed to work safely and quickly on all bong material types. It will get into crevices to help remove all residue and is also non-flammable so you don’t have to worry about a major flame happening if you accidentally leave a little behind. 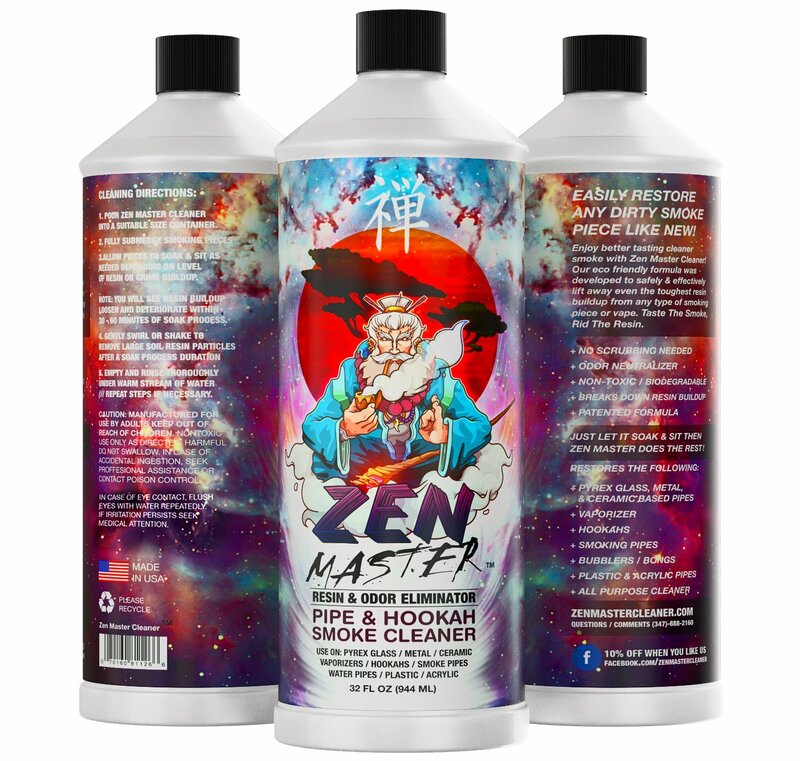 The Zen Master is the perfect way to help clean glass bongs. It comes in a 32 oz. bottle and works well at not only removing buildup inside the bong, but reducing odors in it as well. If you’re looking for an environmentally-friendly way to help clean your bong, Green Piece is a cleaner you’ll want to look at. This liquid cleaner comes in a 16 oz. bottle and is ideal to use with metal, ceramic, and glass bongs. You can pour a little into a bong and shake it up for a quick clean or let it sit in the bong overnight for a deep clean. Besides removing heavy buildup, this cleaner also helps to reduce odors. It comes with a pipe cleaner and a 4 oz. travel bottle you can use when you are on the move with your bong. 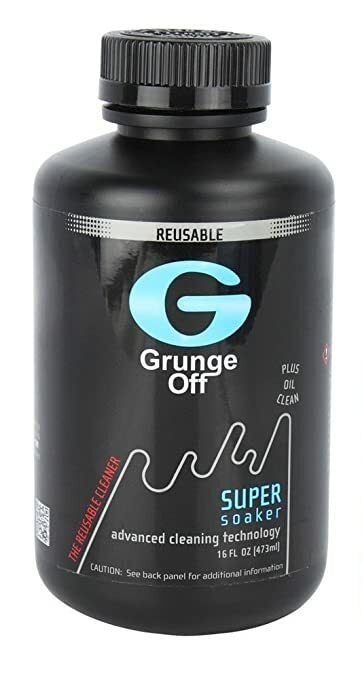 Grunge Off is a liquid cleaner that comes in a 16 oz. bottle. It’s designed to be used for glass bongs and contains no harmful abrasives that could damage and scratch the glass. This eco-friendly choice requires no shaking and works quickly. It even can help to remove odors in your bong. 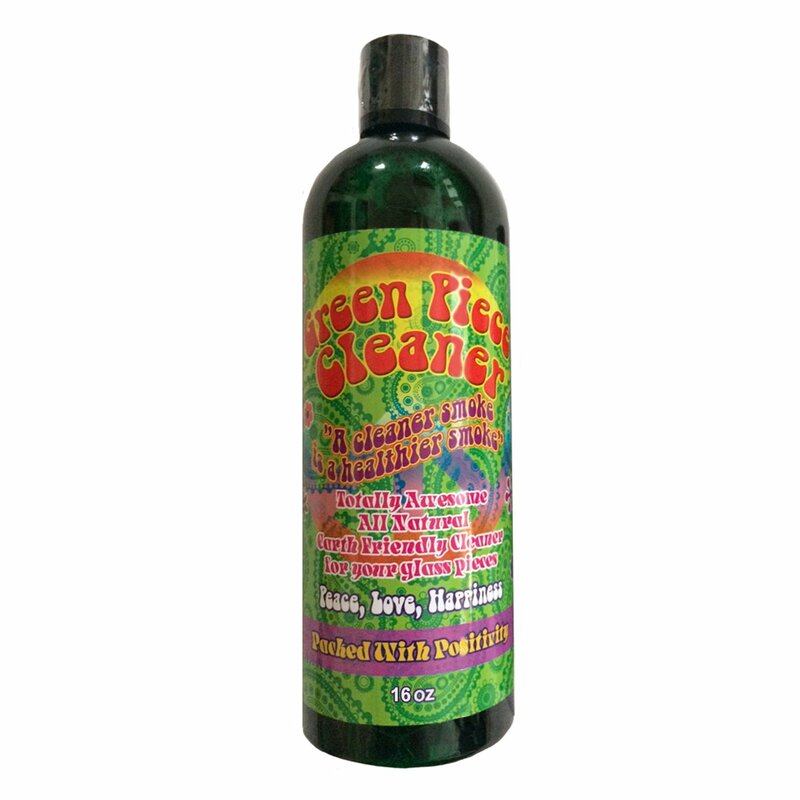 This is a popular liquid cleaner to use with bongs because it works very quickly. 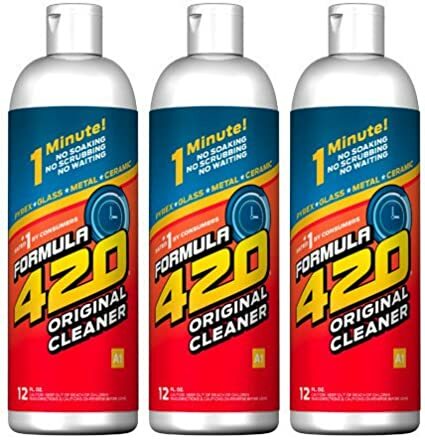 Formula 420 comes in a 3 pack of 12 oz. bottles and will instantly remove residue inside your bong. In fact, it only takes it a minute to do so! This makes it a popular option to use with glass, metal, and ceramic bongs. There are a few ways you can work to clean your bong out. Below are the top 2 methods to try. This method is the best if you just want to give your bong a quick clean after having used it. To do this, you’ll want to first take any removable pieces off and then rinse and soak the entire product in hot water for a few minutes. After doing so, take the pieces out, put them back together, and pour some special bong cleaner into it. Make sure any openings are covered and then shake it up for about a minute to help the cleaner get into all the crevices. Once you do so you can then pour the cleaner out and rinse the bong out again with hot water. It’s important to ensure that the cleaner is entirely washed out so you don’t inhale or consume it. If you use a bong cleaner you can add a little bit (about 2-3 tablespoons) of salt into the bong with the liquid. The salt will act as an adhesive and help the liquid cleaner work better when it tries to break down residue. While this way might take a little longer, it will give you a more intricate clean. Take the bong apart and let it sit for a few hours in hot water to help break up heavy residue inside it. After doing so, rinse it out with more water and then take a brush and scrub the residue out. You can then pour about ½ cup of isopropyl alcohol into the bong to help sanitize it. The alcohol is a great way to help completely remove any traces of bacteria and resin inside so you can be sure it will give the bong a deep clean. After pouring the alcohol into the bong, shake it around for a few minutes so the inside is fully coated in it. Then, pour the alcohol out and rinse the bong out with hot water. You can then take some paper towels and cotton swabs to wipe out the interior as much as possible before rinsing it out again in hot water. You’ll want to make sure to keep rinsing it until all traces of alcohol and liquid cleaner have been removed. While hot water and liquid cleaners can get the job done right, there are a few other unique cleaning tricks you can use. For instance, if you find that no matter how hard you clean your bong there always seems to be stains left behind, you can dab some vinegar on them. The vinegar’s acidity will break away these stains and help your bong look as if it’s brand new. However, don’t overdo the vinegar or it could end up damaging your bong. To help clean the smaller parts of your bong better you can place them in sandwich bags. This will let them soak in a cleaning solution for a bit to help get into the nooks and crannies that might otherwise be missed. You can place the pieces each in their own bag, fill the bags up with some cleaning solution, add a little salt to each, shake them up, and then let them sit before you rinse them out. Another interesting way you can clean your bong is by using rice. If you don’t want to place salt into your bong you can use rice as a substitute. It works the same way because it is an adhesive, but won’t leave behind any salty taste. If you own a bamboo bong you’ll want to use some beeswax. The beeswax will act as a seal to not only help protect the wood from scratches and damages, but help to prevent the wood from absorbing excessive smoke. A good beeswax you can melt and coat your bamboo bong in is the Beesworks Yellow Beeswax Bar. This 1 lb. bar of beeswax comes at an affordable price and is easy to use so it won’t make coating your bong difficult. It’s non-toxic and also works as an anti-bacterial covering to prevent bacteria from forming in your bong. You’ll want to coat the bamboo with this after a few uses or so to keep it fully protected. If you decide to clean your bong with salt, you’ll want to consider the different types of salt. While any salt will do, they each have their own coarseness which is important to keep in mind. Sea salt is very coarse but is small enough to not cause scratches to the bong’s material. Kosher salt is also very coarse and comes in larger grains but dissolves quickly so it doesn’t scratch the surface. Epsom salt is another good choice to use as it can absorb the cleaner better. However, it is much larger and coarser compared to other types so you’ll have to be careful if you put it in glass bongs. While it might be a hassle to constantly rinse your bong out after you use it, it can end up saving you a lot of cleaning time in the end. So, take the time to spend a few minutes just rinsing the bong out with some warm water to prevent extreme resin buildup. When you put water in your bong you might start to see water stains form in it if you use unfiltered water. This is due to the minerals in the unfiltered water building up and staining your bong’s surface. To prevent having to do a hard clean, try to use filtered water as much as you can. As mentioned in the cleaning methods above it’s extremely important you fully clean out your bong from the alcohol and liquid cleaner. If you leave behind any traces of alcohol, for instance, a quick blue flash can occur right before you use your bong. This is not ideal and can be very dangerous so it’s important to wash the bong out well. You also want to keep in mind the type of bong you have. Many bongs are very delicate, especially glass ones, and can scratch and break easily during a cleaning. If you decide to put some salt into the bong when you clean it be aware that the salt can scratch the glass. You need to either use just a small amount of it if you decide to use it or just not use it at all. Cleaning out your bong doesn’t have to be hard or time-consuming. By keeping the tips and cleaning methods mentioned above in mind, you’ll be able to safely clean and use your bong. Better yet, your bong will last for a while because it’s well cleaned.